Along the upper part of the scenic Illinois River, from I-80 in the north to I-72 in the south, lies the Illinois River Wine Trail. This wine trail currently features seven Central Illinois wineries, each presenting their beautiful land for your pleasure and their best vintages for your consideration. Many have year-round events, offer rental space for special occasions, and all welcome your visit! Pair your winery expedition with a drive along the Illinois River Road Scenic Byway. Covering 2/3 of the Illinois River Wine Trail area on both the east and west side of the river, this drive lets you visit many charming communities and see some of Illinois’ scenic wonders on your way to the different Central Illinois wineries. Looking to make your journey along the Illinois River Wine Trail a multi-day outing? 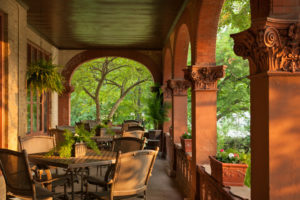 Why not stay at a Central Illinois bed and breakfast? Member inns of the Illinois Bed & Breakfast Association welcome you to the area!